This post is an exploration of OPOE's 2014 funding campaign - it is not a comprehensive, how-to guide but rather an examination of lessons learned from a small two-person team... plus a top-ten list for those of you looking to launch your own campaign. We are well past the point where crowdfunding is seen as a novel enterprise of the passionate artist. Crowdfunding consultants are as common as crowdfunding fatigue. But, while much of the mystery is gone, crowdfunding has proven itself a viable method of raising money. The peer-to-peer, fan-to-artist, support structure is an immensely powerful idea, and if used wisely, can be a career-building business venture with all the associated short-term and long-term costs and gains. In the short term: if you do your research, plan well, don’t rush, and set realistic goals based on your strengths and weaknesses, the odds are immensely in your favor. In the long-term: if you start humbly, and build authentic relationships over time, you can sustain a career based on the support of your fans. What if you ran 20 project campaigns, one a year, starting small and slowing increasing your audience year after year? That is long-term strategic thinking. Contrast this with the projects we hear most about: those projects that exceed their goal by millions, win legions of new fans, and become overnight celebrities. While these campaigns are undoubtedly great success stories, they unfortunately fuel the thinking that all campaigns need to be life-altering success stories. We have been duped into thinking this should be the goal of all campaigns and even fuels that segment of our culture’s empty, “get rich quick”, mentality. The truth is that all campaigns take a lot of work, and the best ones have many of the exceptional traits you would expect: great planning, an existing fan base, a great team, great video(s), charismatic people, great media connections, the writing exudes excitement and they engage a multitude of people through all social channels, etc., etc. Our team was small (2), our existing fan base small (90 Facebook fans, 300+ email contacts), and we definitely aren’t famous. But we planned well, budgeted closely, and identified what made our project different, valuable, and messaged it the best we could. We kept our heads throughout the ups and downs, and in the end came out okay. Before we dive into the next section, note that the ideas above are based on a year’s worth of hindsight. I definitely did not enter into crowdfunding with the idea that I would use it as the first stone of a long path spanning many years. I’m still just a beginner. I haven’t even started campaign #2 - but I am heading in that direction. We would be doing all the research, and production ourselves, pulling in assistance from interns, colleagues, and friends where we could. While this timeline has proved extremely rigorous (subject for another article) we are currently on track for a September completion date (fingers crossed). From February to April 2014, we designed our project. We identified interesting community-scale climate change projects from around the world and reached out to the communities and organizations implementing these projects to gauge their interest in partnering with us. In the end, we found the strongest partners and case-studies in the Caribbean, Nicaragua, and Finland. Once we identified our travel locations and timeline (or at least our preferred locations, since the formal approval process for a number of countries took many months to organize) we spent about a month developing our budget. This included everything we could imagine spending money on. Given the variety of locations around the world, this proved extremely challenging and time consuming. For some costs, we just had to guess. How much is a bus ride in St. Vincent? Hard to know. We accounted for every flight, microphone, SD card and when we were finished, we had a giant spreadsheet and a clear understanding (at least a sense of scale) of what our project would cost. We didn’t end up doing this, but we recommend adding in a contingency estimate into your budget. We originally estimated about a 7% contingency but eventually trimmed this before launching. With budget in hand, we figured out what we could afford to put in ourselves, what we could raise privately, and the remainder was our crowdfunding goal. Why a robust budget is extremely important to successful crowdfunding: When approaching crowdfunding as a potential funding source, a clear budget is essential. If you don’t know what your project will cost, you won’t know what to ask for. As a consequence 1) you may ask for too much money and not reach your goal or 2) you may ask for too little money and in the end struggle to complete your project and repay rewards. But, essentially, you need to try and calculate your current reach and determine if your campaign goal is achievable. First, calculate the average contribution (I’ve seen both $50 and $70, but I’ll take the lower one) then divide the amount you need by this number you will get an estimate (or goal) of the number of needed contributors. For example, if you need to raise $20,000 and the average donation is $50, you would need 400 contributors to reach your goal. 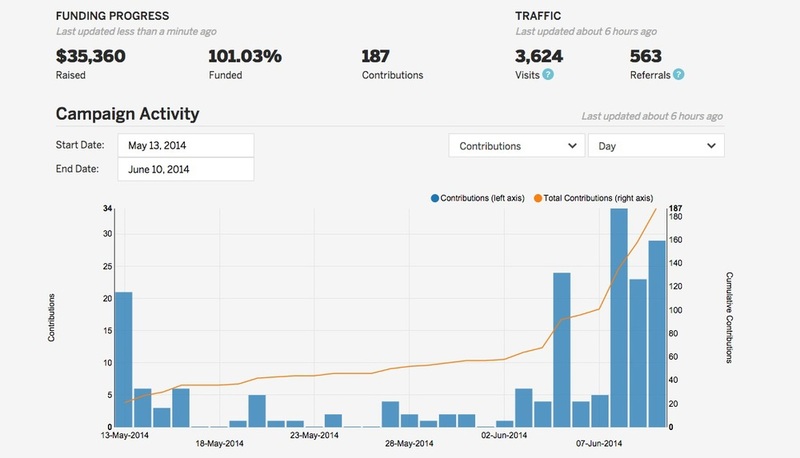 Can you convince 400 people to contribute to your campaign? Calculate your current audience. How many family and friends will contribute? How big is your email list? The email list is your most important asset when fundraising. Tip #1 | If you have a website and aren’t capturing emails - start now with a pop-up or newsletter signup. Continue to gather emails throughout the campaign and throughout your career. How many FB friends/fans do you have? Keep in mind that, while your social networks are important for updates and engagement on your project, the conversion rates (i.e. the rate at which people find your project and then contribute) are much lower on social platforms than through direct email. The more important avenues to drive traffic to your campaign are blogs and articles from news platforms that have existing audiences. People read a blog about your project, read a Huffington post article, then share it on FB and their friends find it and share it. Can you reach these news outlets? If you don’t have a built-in audience, you need to leverage your connections, writing skills, personality, etc., to be read / seen / heard and reach that magic number of contributors. Simply put: if your audience isn’t there, or you don’t have a plan to build that audience, you won’t raise the money you need. While we don’t have time to discuss all the aspects of a marketing plan, I want to talk briefly about partnerships and engagement. To get your project out into the vast, noisy world, having media channels with existing audiences writing about your project is the best way to reach more people. We reached out to a variety of news outlets before our campaign began. We put together a downloadable press package and press release on our project and sent it out. We also sent personal emails to blogs and magazines that aligned with our project. I don’t want to get deep into this, but bloggers, new agencies, etc., are inundated with requests for promotion, so make sure your content is relevant to their audience, and start the conversation well before the launch of your campaign. The key to social media is being social. Have conversations on twitter, leave messages on blogs, start building awareness of your unique perspective and project. Tip #2 | If you're uncomfortable with social media and don't feel like you want to invest your energy here - don't make it a priority. But you do need to find another way to reach people. If you're better on the phone or reaching people over email, that will be time better spent. Don't lose sight of what you're good at just because everyone says you "need to be social". That said, I do recommend getting out of your comfort zone and trying new things, bit by bit. In the second week of the campaign, when we knew things would be getting slow, we paid to have our project promoted on Planetizen, a website whose audience is closely aligned with ours. The payoff was minimal (a few website subscribers) but we probably wouldn’t go this route again. Once you have your budget, you can start to think about your platform. Initially we scoped Seed & Spark, Kickstarter, and Indiegogo. All these platforms have their pros and cons, but we went for Kickstarter because their audience size is the largest and we figured we had the best chance for exposure. We ruled out Seed & Spark mainly because 1) it’s only movie-based and 2) we didn’t find any other climate change related films on S&S, so we figured our audience on this platform would be limited. Our one concern with Kickstarter was that because our project included low-cost film workshops and the case studies, we weren’t sure we qualified for Kickstarter’s “creative projects only” policy. TIP #3 | To not slow down our early-May campaign launch goal, we simultaneously applied to Indiegogo as a backup, which was lucky because in the end we did not qualify for Kickstarter. 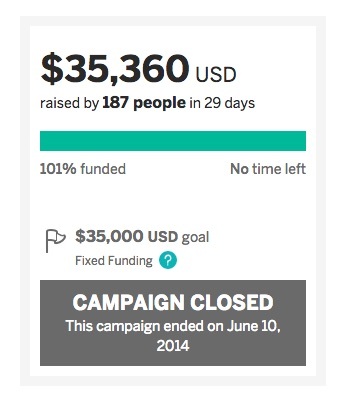 Going with Indiegogo did not end up hurting us. Although Indiegogo has a smaller community, their fees are slightly less - they take only 4% of your “all or nothing campaign”, as opposed to Kickstarter’s 5%. Note: We decided to go for the “all or nothing” campaign because that was the amount we needed for the project to be successful. With a “flexible funding” campaign, Indiegogo would take 9% of our contributions, and we would potentially be stuck trying to finish the entire project (and repay all the rewards) on a reduced budget that wouldn’t meet our needs. Also, don’t forget the credit card processing fees: in the end, we ended up paying 7% in fees - 4% to Indiegogo and 3% to PayPal. Whether it’s the project section of a Kickstarter campaign or a grant application, writing a great project description takes a lot of time, so make sure to plan for this. Make sure to account for the time to submit the app through the online platform. All platforms are different and some are very cumbersome. Most of these forms have word limits, so look over the application carefully before you write and track your word count in a word doc. In the case of Kickstarter and Indiegogo especially, make sure to account for the time to get approved. This process may take several days, and if changes are needed before approval is granted, you may need time to make adjustments to your campaign and this will extend your timeline for launch. Spoiler alert right after this colon: Our Indiegogo campaign was successful! We raised just over $35,000. Looking at the Prefundia prediction - campaigns similar to ours raised $13,926 - if you subtract our 3 largest donors ($10,000, $5,000 ~$5,000) that puts at about $15,000 raised, which is pretty close to what Prefundia predicted. You can take or leave the above data, but certainly the larger benefit of Prefundia was that it gave us an opportunity to “soft launch” our campaign - prepare our story, photos, any materials we wanted our audience to interact with and get them out there. In addition, I really recommend reading through the plethora of blog entries Prefundia has. While many of the blogs are geared toward products rather than projects, there is a lot of crossover in relevant content and the articles helped us think about our campaign in different, more critical ways. Your hook, what makes you different, your unique selling proposition, is your most important tool for reaching your audience. Indeed, if you’re not sure why your project is different, amazing, or important, then you might need to go back to the drawing board. Take your time crafting your story on paper. The more ideas you can put on paper and the more time you can spend refining them, the easier it will be to create 1) a compelling website, 2) a good press kit, 3) give an elevator speech to funders and friends, 4) create the written section for your crowdfunding campaign and grant applications, and 6) produce, edit, and sell your project. 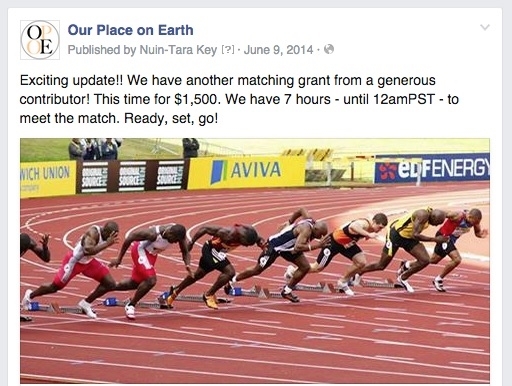 For your crowdfunding site, take your time crafting your message. Don’t forget that there are a ton of campaigns out there and the structure of the written content is just as important as your video. Many people won’t even bother watching your video - they will simply skip down the page to get a quick overview of your project. This is where you can grab them. Think carefully about your headline (or logline) and first paragraph. Grab people early with your concept and get into the details later. While we had some really nice rewards, we didn’t get especially creative about rewards. Contributors could receive photographs from our travels, the movie, social shout-outs, we offered to take a miniature “travel-buddy” along with us and take photos of them around the world (think Amalie’s globe-trotting gnome). The biggest hit of our campaign rewards was our artist friend Sayuri’s jellyfish. Some contributors gave twice just to snag one of her wonderful jellyfish. As much as people are investing in your idea, they are also investing for the rewards and a tangible benefit upfront gives some incentive, potentially years before your project ends. While rewards are important, many campaigns have succeeded with very standard rewards. Make sure people are clear about what they get for contributing and have a plan to deliver. Partner with artists doing great work! Think about staggering special rewards like these throughout the middle of the campaign, boosting interest during the lonely middle days of the campaign. To be candid: our Indiegogo video was a bit of a nightmare to produce and only by taking a big left turn at the end did it finally come together. Our goal was the typical crowdfunding video: stand in front of the camera and – with passion – tell people why your project is great and why they should support you. Easy, right? Not even close. I did a crazy set up at first: two cameras, lights, careful composition – I’m a filmmaker after all and, if nothing else, the video should look professional, right? But when it came for us to deliver the message, we fell totally flat. The complexity of our three-part project, and the necessity in getting the element across quickly, made it very difficult to talk naturally and candidly. Eventually we wrote our lines on cue cards, but the end result felt way too long and uninspired. You have to know when to call it quits for the day, so we called it a wrap and started fresh the next day. The elements that worked from the day before were when we talked to each other, so we decided to make life easy and just sit in front of Nuin-Tara’s computer, like we were Skype-ing with our audience. This made life easier for me too because I didn’t have to deal with lights or doing a bunch of complicated editing. But again, like the day before, we were unable to deliver our message in a compelling manner. However, there were a lot of entertaining outtakes - at least some made us laugh - so I complied the few clips where we delivered our message well and some outtakes. For the rest of the day, I wrote a voiceover script and filmed animated drawings that outlined the major themes of our project. The end result was something a bit more entertaining than just us in front of the camera. In the end, the thing to remember is that people are investing in you. You are trying to convince them that you are doing something interesting and that you can complete it. That’s one of the nicest parts about crowdfunding. It was our first campaign and we made some mistakes. The first of which was to travel during the launch of our campaign. Traveling added unnecessary stress and responsibility at a time when our emotional and mental attention needed to be focused on the campaign. That said, I want to add a caveat here - and this has to do with my overall feeling that a well-designed campaign doesn’t have to take over your life: things come up. Life happens. If your campaign is well designed; FB and twitter posts are timed; blogs are reached on schedule; contributors emailed and thanked in good time; you can be relaxed about the experience, and take your time. The launch of your campaign should be big. People should know well ahead of time about your project and be ready to contribute when you hit “go”. A big launch can send a strong signal that your campaign and project will be successful. TIP #4 | Write your friends ahead of time and ask them to share your project with their friends. See if you can get some big contributors lined up to give early. That said, we didn’t have an especially fruitful first few days. We raised about $3,000 in the first two days. This represented contributions from our most ardent followers. After that, giving was slow and sporadic until the end. Matching donations – these were the biggest method of engagement and our audience really rose to the challenge. These are fun and it gives people a reason to contribute in the middle of a campaign rather than at the end when everyone else is kicking in and the funding needle is rising rapidly. Matching donations are little “micro endings” or “micro goals”, something with a beginning and an end that people can watch at home after work and participate in. In fact, a few of our donor contributed to more than one matching drive. We reached out directly to people to ask if they would be interested in providing a larger matching donation. Some we knew about in advance, and some we asked during the campaign. Finish strong: the last days of your campaign are the most important. Many campaigns go from 25 - 100 percent in the final hours. It will be hectic, so save your energy and have a plan for the final days. If you have media connections, or can schedule another post on a blog with a large audience, this is your chance to get some buzz going. In the final few hours we hit our goal, and then the funding stream nozzle abruptly turned off. People often talk about stretch goals (pushing your audience to contribute beyond your goal) but we were exhausted, and we figured our audience was exhausted, so we didn’t push. In the end, we had enough momentum to get us over the finish line and meet our goal. Not over and not under, just average - just right. I produced a Kickstarter video for a friend and, while her campaign was very successful, soon afterward she got sick and got behind on her rewards. The outpouring of hateful messages she received from people missing their rewards was astonishing. Contributors trolled her on Twitter and Facebook and she had to close her Kickstarter message board because of all the awful things people were saying. Her business was essentially destroyed. And don’t forget to allow for time to manage your rewards. First, figure out a way to keep track of your contributors and their rewards. 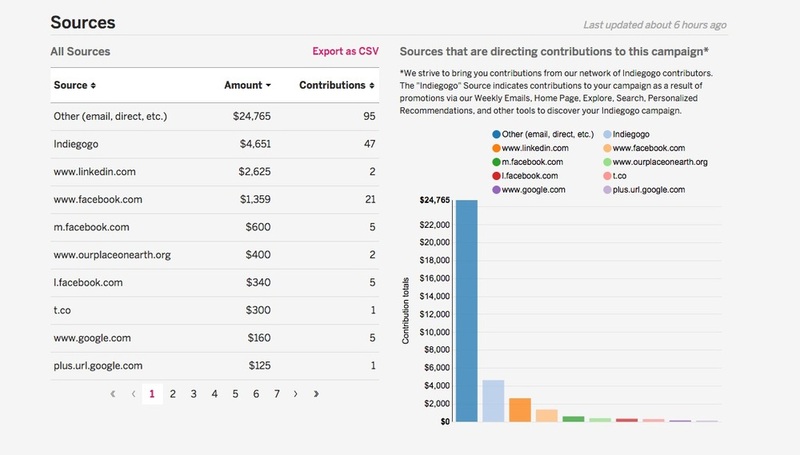 We weren’t totally satisfied with Indiegogo’s analytics or data downloading capabilities, so it took a little time to create a tracking format that worked for us. Also, it takes time to fulfill your rewards. For us, it was also great to know that we had a group of people that not only believed in us but were interested in what we were doing - it was satisfying to approach our rewards as part of a conversation with our contributors. 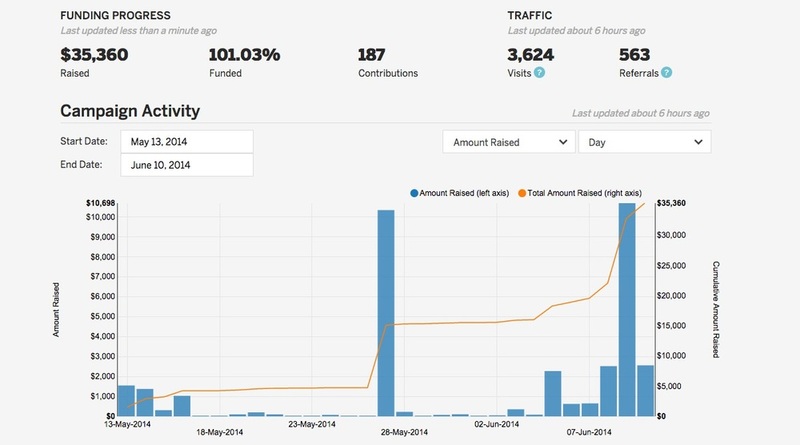 Treat crowdfunding as a long-term, career building venture. This will help you focus your long-term priorities and build authentic, lasting relationships. Get your elevator speech down early. And work on it - constantly. There are templates and examples for everything. Use them. They will save you time and money. Don’t try to create everything from scratch by yourself. Make a plan for everything... but, like everything else in life, know this will change. The beginning and the end of your campaign are the most important. Have a plan for how you will hit day one hard and finish strong. Don’t stress the middle of your campaign. Stay connected with people, reach out to news outlets and blogs according to your marketing plan, but remember: usually nothing much happens here. Stay calm and stop refreshing your campaign button every five minutes. Budget well. Your budget will give you the baseline for success. Everything depends upon your budget. Put aside expected reward costs immediately after the campaign ends. If you need to withdraw this as cash and put it in your sock drawer, do it. Not spending this money on production will reduce a scramble later and fulfill your obligations to your generous contributors. Your idea is your best sales tool. Find your unique selling proposition and hammer it hard. If you don’t know why your project is important and different, then this is the first thing you should figure out. Work hard and finish what you start. This might not always pay off in the short term, but you’ll benefit in the years to come.